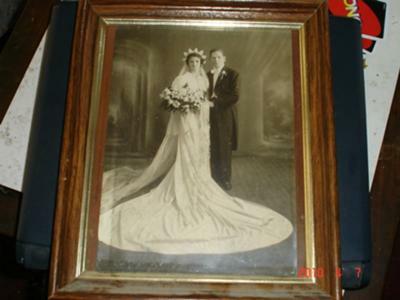 When I moved in to my new house, I unpacked the framed photos and found the one of my grandparents on their wedding day. It reminded me of the last time I saw them before the diagnosis. It was January and I was home from college on winter break. There was snow the night before, so I went to Grandma Sarah and Grandpa Sam's house to offer to shovel their walk. Of course that was just an excuse to spend time with them. When I knocked on the door, Grandma Sarah opened it and I saw her smiling face. Her gray hair was getting grayer, and she was a bit stooped over from the osteoparosis, but the sight of her made me all warm and cozy inside. Grandpa Sam was waiting at the top of the stairs as I entered to the pleasing scents of his cigars and Grandma's coffee. Of course, I wouldn't partake in either; the scents were pleasing because they were Grandpa's and Grandma's. Grandma served me vanilla sandwich cookies and cream soda. We chatted about how I was doing in school, their activities at the local senior center, and what the rest of the family was doing. We reminisced about good times together with our whole family. I didn't know what it was, or why I felt that way, but when I looked into Grandpa Sam's blue eyes, something inside me was telling me that this might be the last time I saw Grandma Sarah and Grandpa Sam. I couldn't very well tell them that, but at the same time, I wanted to make the most of the time I spent with them that day. I wasn't even focusing on the conversation all that much. I was more focused on the love I felt for these two people who had raised the man who had raised me. We didn't have to say anything to know the affection we had for each other. That was a touching story. Well written! Thank you for sharing this wonderful story about your family.